Friends, I am well and truly over the zombie pop-culture craze — movies, TV shows, action figures, you name it (I’m looking at you, The Winter People). So I was a bit irked when I realized I’d been tricked into reading a zombie thriller novel. Then things got weird. Haunted houses full of secret compartments, a madwoman’s hidden diary, Indian wise women, cursed rings, evil woods where shadowy figures lurk… there’s a whole lot of creepy paranormal phenomena, but does it add up to a good story? Since their father’s death, rebellious teen Ruthie and her young sister Fawn have been struggling to make ends meet in the rural Vermont farmhouse where they live with their mother, Alice. Because of their off-the-grid, antisocial ways, their home is far from town, and when Alice vanishes into thin air one night, the girls are isolated, scared, and unsure what to do. While searching for their mother, Ruthie discovers an old diary written by Sara Harrison Shea, who lived in the same house a hundred years ago and was gruesomely murdered in 1908, shortly after the tragic death of her daughter. Since then, it’s said, Sara has walked the area as a ghost, and the odd, violent killings that crop up from time to time are attributed to her vengeful spirit. Now, with her entire family in danger, Ruthie must unearth the truth about what happened to Sara and the eerie phenomena that have cursed their land for a century. In books that have storylines set in the past and present, the chapters about the past can automatically seem more interesting, compared to the mundane daily lives of a contemporary middle-class American family. 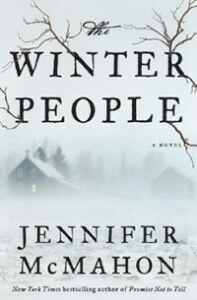 The Winter People is no exception, and Sara has the benefit of a little pioneer pixie dust glittering exotically over her everyday stories of plucking chickens and baking molasses cookies in a wood stove, even before the bloody mayhem starts. Sara’s storyline thrums with a sustained, palpable tension and the threat of violence — even if it’s nothing more than her rapidly deteriorating mental state, as her neighbors believe. By contrast, the Ruthie storyline plods, unable to do much with the simple absence of a person; overcompensating, the author piles on minor characters, unlikely coincidences, and irrelevant subplots to keep the action headed toward a climax involving a magic spell to bring the dead back to life (no spoilers, it’s mentioned in the first chapter). Toward the end, the sheer quantity of occult paraphernalia is piled so high that literally anything could have happened and I would have just shrugged. Which is probably not the shock value McMahon was going for. The premise, and the Sara chapters, were intriguing enough for me to keep going, but when the main reason for a present-day storyline is figuring out what happened in the past storyline, I tend to think we could trim the fat and just follow the more exciting story. If you’re home alone one night and want to spook yourself with a tale of eeeeevil, The Winter People sets an enjoyably creepy mood, though the horror-movie tropes may seem a little silly by the light of day.